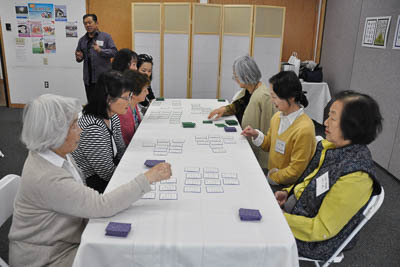 Join the San Francisco Karuta Kai and Satsuki-kai Karuta Club to play karuta, which is also called “Hyakunin Isshu,” or “One Hundred Poems by One Hundred Poets.” One hundred poems were selected by Fujiwara-no-Teika in the 13th century and incorporated into a card game in the 16th century. The game consists of a reader reciting the first three lines of a poem and the players competing to see who can grab the corresponding card the fastest. Anyone who can read hiragana can join the game. Everyone can play bosan mekuri, which uses cards with pictures. After the Festival, join the groups for games once a month in Japantown!